German soldiers react to concentration camp footage [PHOTO]. 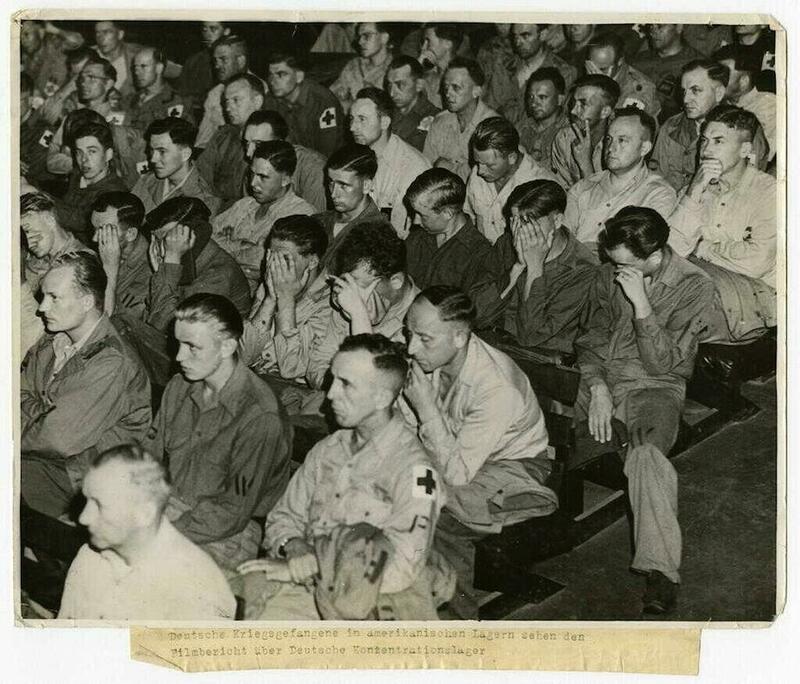 This image, held by the United States Holocaust Memorial Museum, shows the faces of German POWs, captured by Americans, watching a film about a concentration camp. There’s another view of this scene that was taken from the back of the theater, but in this frame, the photographer has turned the lens on the audience to capture their reactions in the moment. As part of the Allied policy of postwar denazification, meant to purge Germany of the remnants of Nazi rule and rebuild its civil society, infrastructure, and economy, “forced confrontation” brought Germans face-to-face with the worst works of the Third Reich. Confrontations took multiple forms, as American and British military officials adapted their tactics based on local conditions. The Holocaust Museum’s digital archive holds many photographs and films recording these encounters. In this newsreel, civilians tour Buchenwald, viewing atrocities ranging from piles of bodies to a prisoner’s crippling case of trenchfoot. In this photograph, Austrian civilians look at images of concentration camps, posted in a public place. And in this one, townspeople dig graves for the bodies of concentration camp internees who were killed as the Allies approached. Film was important in bringing images of the camps to far-flung villages. Here, footage filmed by the British army shows the residents of the German town of Burgsteinfurt being marched to the cinema by soldiers to see a film about Belsen and Buchenwald. Just as this still image shows soldiers’ faces in reaction to the screen, the video ends with close-ups of the townspeople leaving the theater, as the camera seeks any kind of change in their expressions. Most, however, stare straight ahead, avoiding the gaze of the occupiers. Germany, 1945. Caption reads: “German prisoners of war held in an American camp watch a film about German concentration camps.” United States Holocaust Memorial Museum, courtesy of Joseph Eaton. Copyright United States Holocaust Memorial Museum.